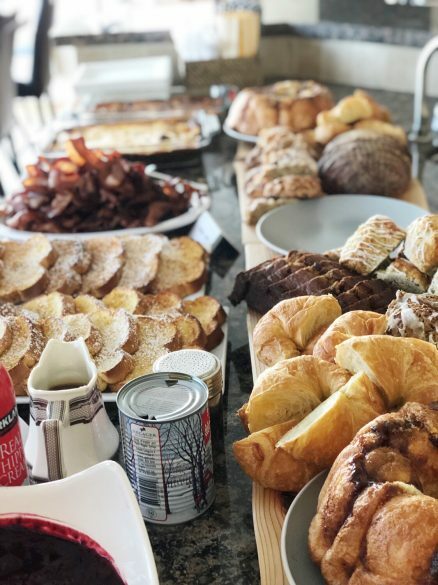 This past weekend, we had Mac’s hockey team and parents in for brunch. 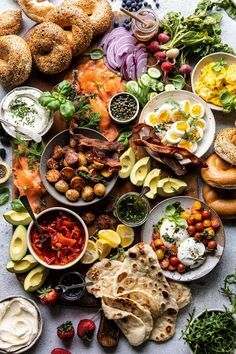 I know I’ve said this before, but I LOVE brunch! It’s my favorite meal to go out for and it’s my favorite meal to have people in for! My biggest fear is running out of food, so I wanted to be sure to have enough, and if Mac’s appetite is any indication of how much the boys might eat, I was going to be prepared to feed an army! 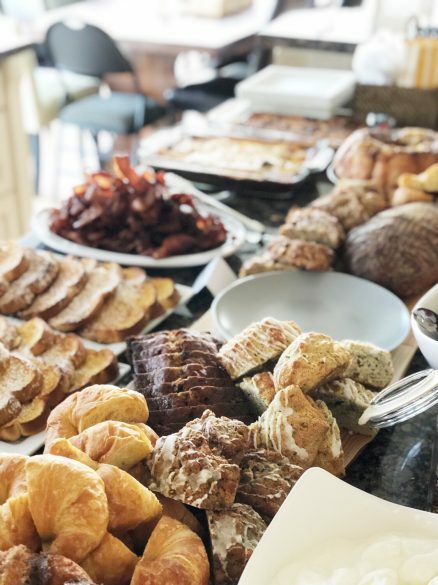 Here are a couple of tips for serving brunch to a large group…. Plan your menu in advance and find recipes that can be prepped or made ahead. Set up your buffet area the night before and lay out platters and serving pieces and label them. Have a beverage station away from the buffet area for easy traffic flow. Egg and Sausage Bake – this can all be prepared in advance and baked the morning of, and it’s low carb. Oven-Baked French Toast – I’m not a huge fan of the French toast-type casseroles. With this recipe, you can make the “batter” in advance and then dip the pieces of bread and bake on large cookie sheets. I bought extra large cookie sheets so that I could get 16 pieces of French toast on each pan at a time. I served the French toast with homemade berry sauce, made the day before, whipped cream, buttermilk caramel sauce and this maple syrup. Charcuterie Board of Baked Goods – this also provided the decor for the buffet area. 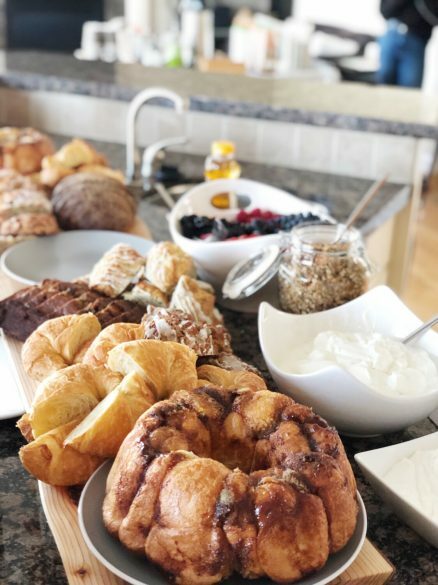 I included scones from Purebread, sourdough from Little Brother, croissants, banana bread (I used chocolate chips instead of blueberries) and Land of Nod. Again, Land of Nod is prepped the night before and then baked the morning of! Bacon – I DO NOT like cooking bacon in the house and we needed to cook up 5 packages. Our trick is to make bacon on the BBQ. Jason has perfected a method and you don’t have any of that smell in the house! He heats the BBQ on high for about 20 minutes before he gets started. I get foil cookie sheets and foil broiler pans from Walmart. He cooks the bacon on the foil cookie sheets on the main grill. Be super careful as flare ups will happen! When the bacon is almost done, he moves it to the broiler foil sheets (they have holes in them) on the warming rack on the BBQ to finish it up. There you have it…no lingering bacon smell in the house and easy clean up! Yogurt Bar – ok, Jason thought that this wouldn’t be popular with the boys, but I proved him wrong! It was a big hit. I served plain a Greek yogurt and coconut yogurt with gluten-free, nut-free homemade granola (substitute sunflower seeds for the almonds), fresh berries, pomegranate seeds and honey. I made the granola earlier in the week and kept it in an air-tight container. We had such a great morning, and I wasn’t stressed out because I was able to prep so much in advance. I wished I had taken more pics….ahhh! It warmed my heart to see the boys going for seconds and thirds. Anyone who appreciates my cooking is welcome back anytime!